This article covers how to automatically delete tweets based on likes and retweets. You can specify the number of likes and retweets and tweets less than the specified likes and retweets will be deleted from your Twitter account. This is an easier way to clean your Twitter timeline and remove old tweets that don’t come under the condition (likes and retweets) set by you. To delete tweets based on likes and retweets, I have used a free software called “Social Amnesia“. You can login with your Twitter account and then set the conditions. This software also lets you confirm before you finally delete the tweets. So, you can first confirm the step and then delete your tweets. In the screenshot above, you can see options are visible to set number of likes and retweets based on which tweets will be deleted. Note: This software also helps to delete your Reddit submissions/comments. But, this article is focused only on deleting the tweets. How to Automatically Delete Tweets Based on Likes and Retweets? Step 1: Download the RAR file of this software with the help of link given at the end of this tutorial. Extract the RAR file and run SocialAmnesia.exe application file available in the extracted folder. 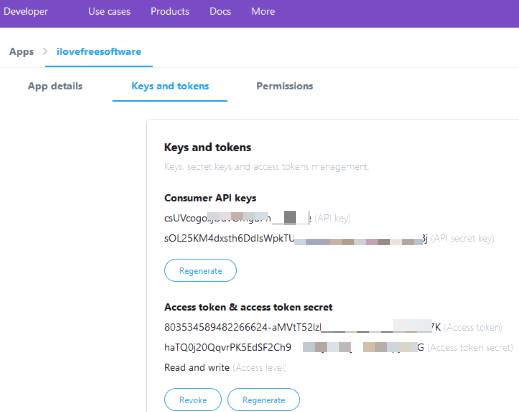 You need to access your Twitter app dashboard by logging into Twitter Developer Platform page and then access Keys and tokens section. Delete tweets that have fewer retweets than. For both the options, you can set values of your choice. 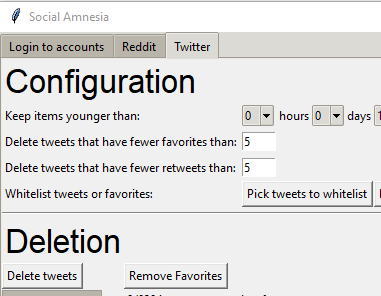 You can also set number of days, weeks, and years to delete old tweets. After that, click on Delete tweets button. It will process tweets and find those tweets that meet the conditions. A separate window is opened in which you can see the list of those tweets that will be deleted. Finally, you can use Proceed button. This will clear all your tweets based on likes and/or retweets set by you. You must have so many tweets that have less likes/retweets than others and you want to delete them for some reason. For that, this software can be very useful. Just connect your Twitter account, set values, and delete tweets based on likes and retweets.